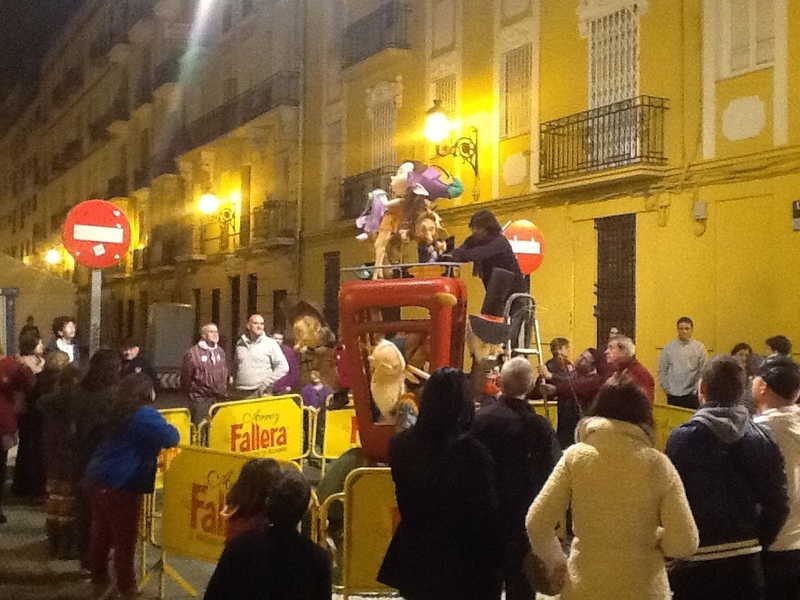 Fallas have come and gone and the streets and the city have returned to normal. 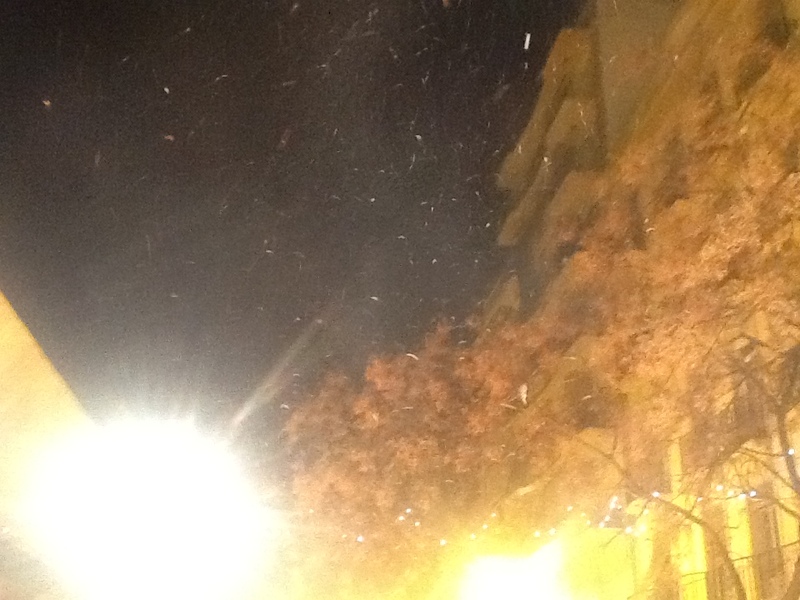 It is amazing how quickly everything disappears. 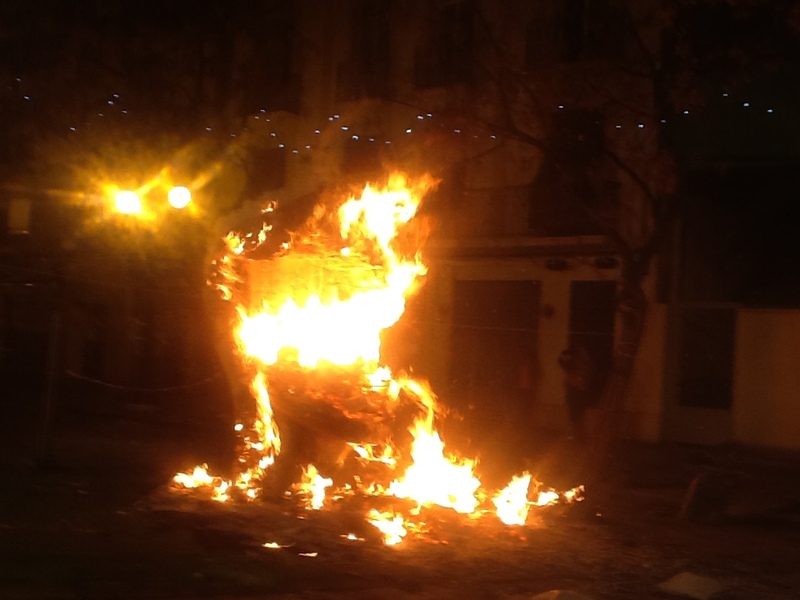 The stands selling food and beverages are gone and so are the tent-like structures that house all the mercadillos. 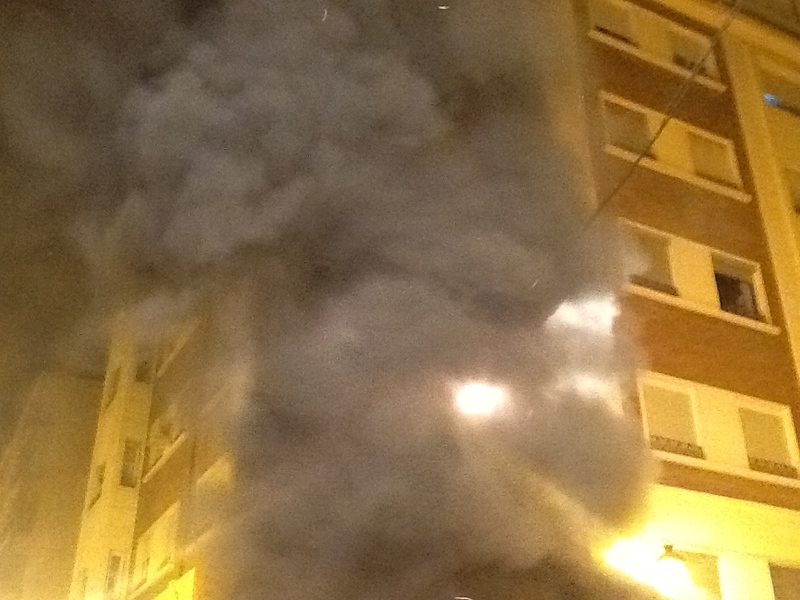 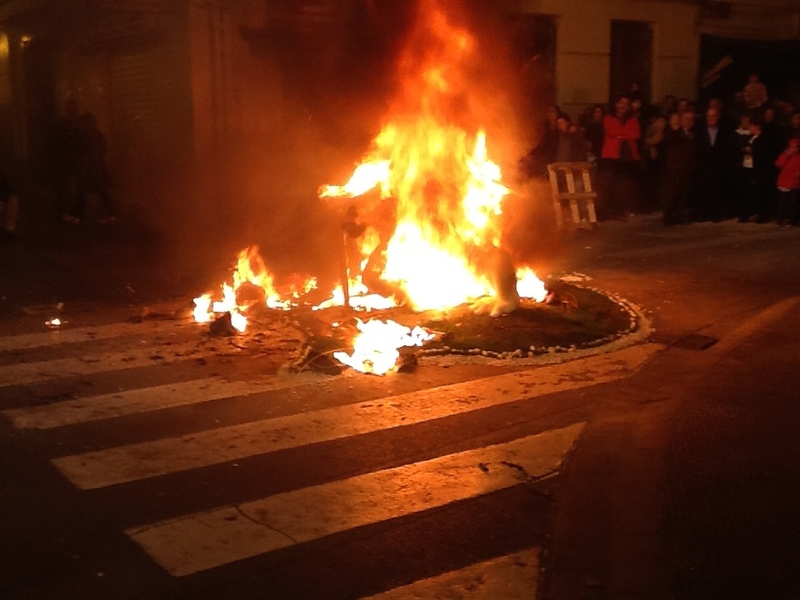 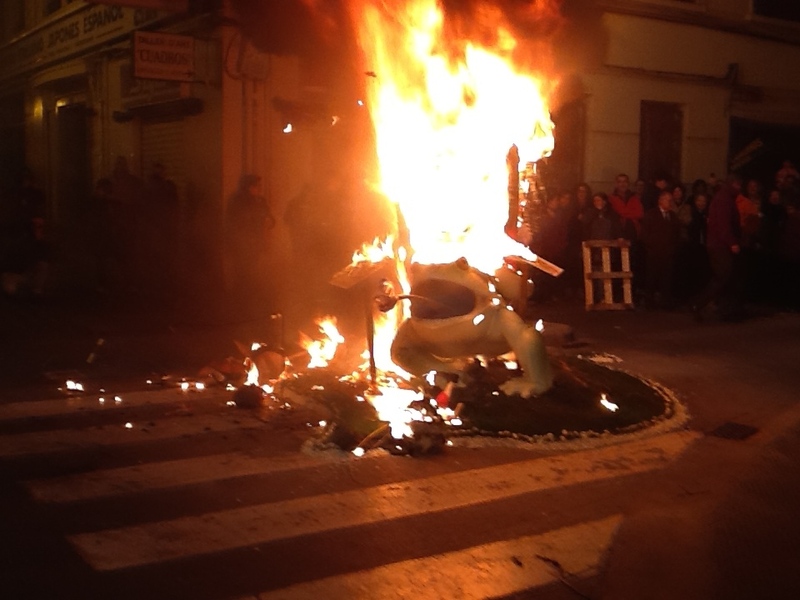 If you came to Valencia today, you would have no idea that Fallas ever happened. 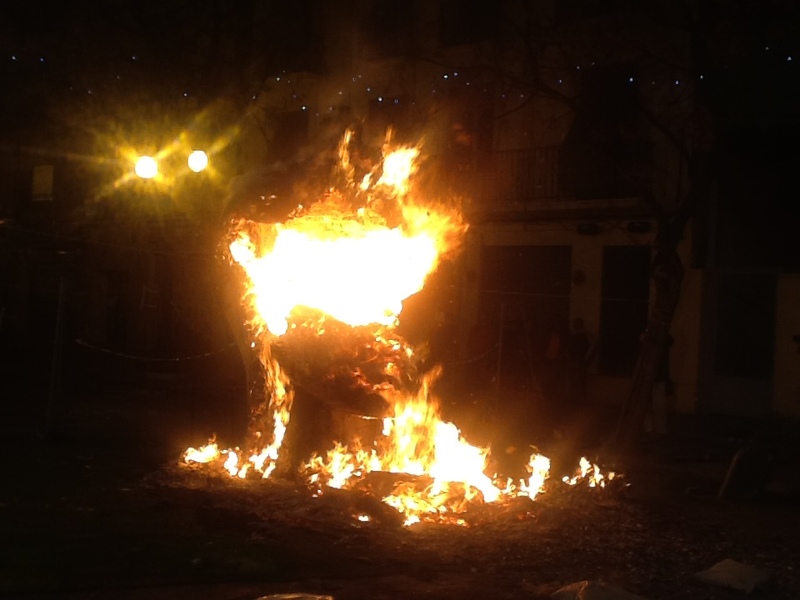 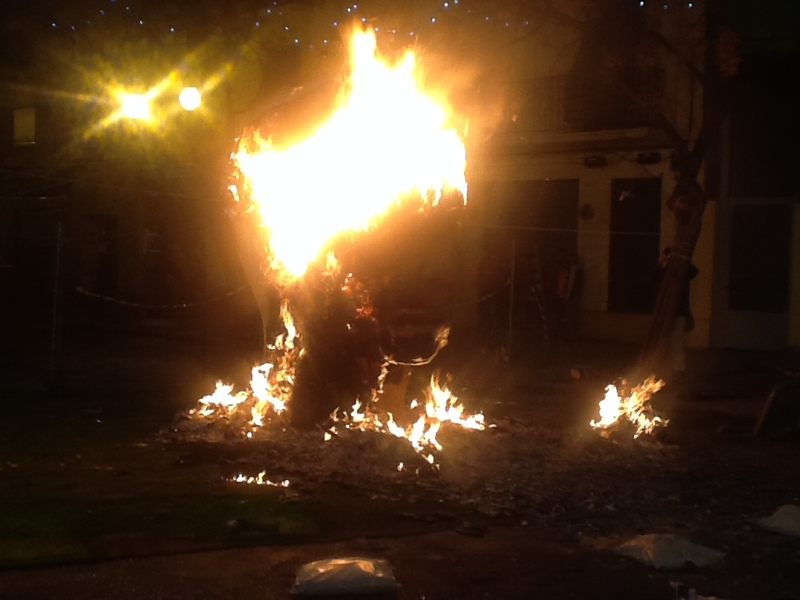 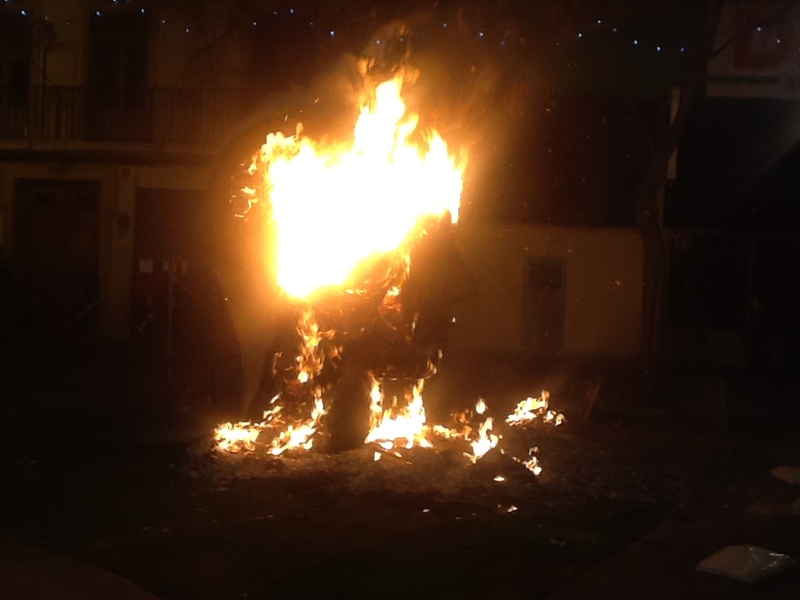 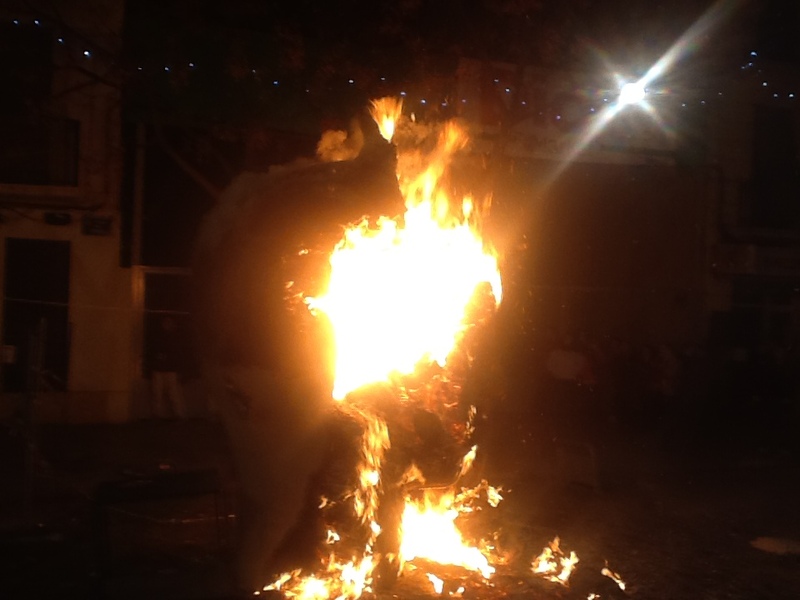 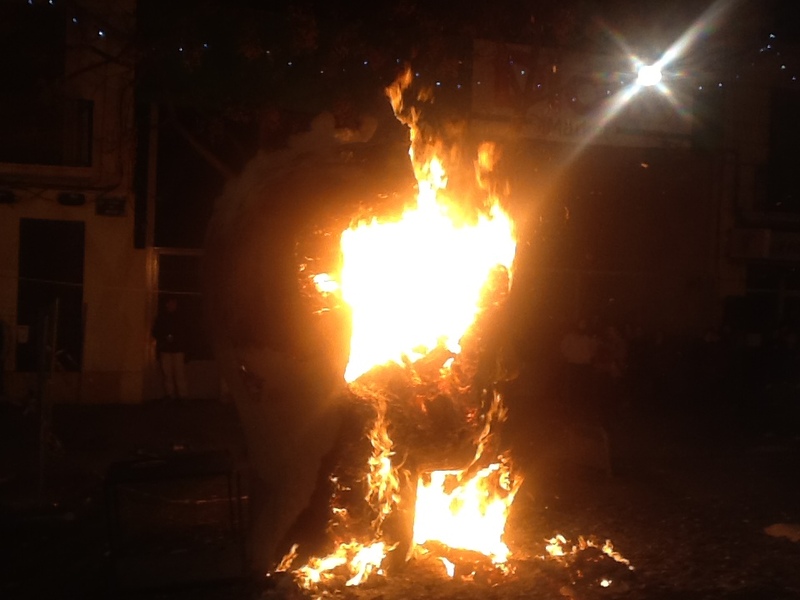 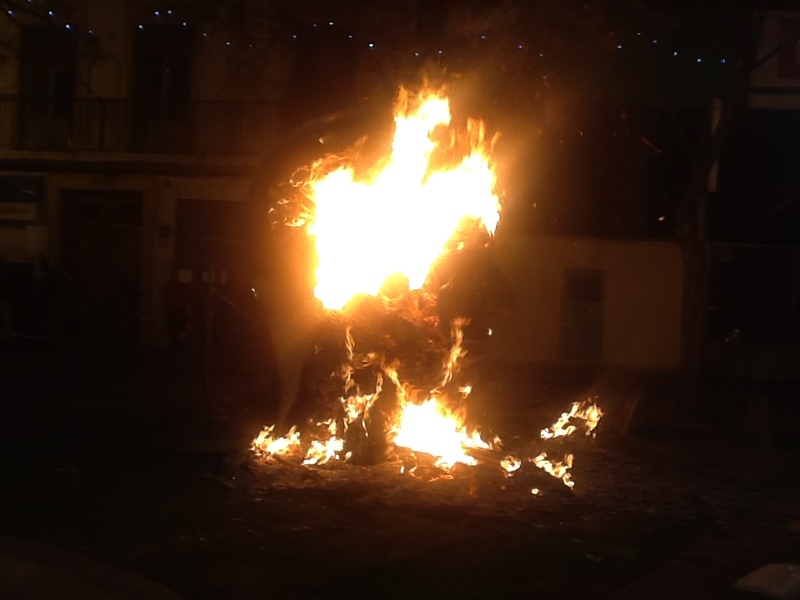 We headed down to the casal at 9:00 PM yesterday to witness the burning of the children’s falla, followed by tapas in the tent and, lastly, the burning of the main falla. 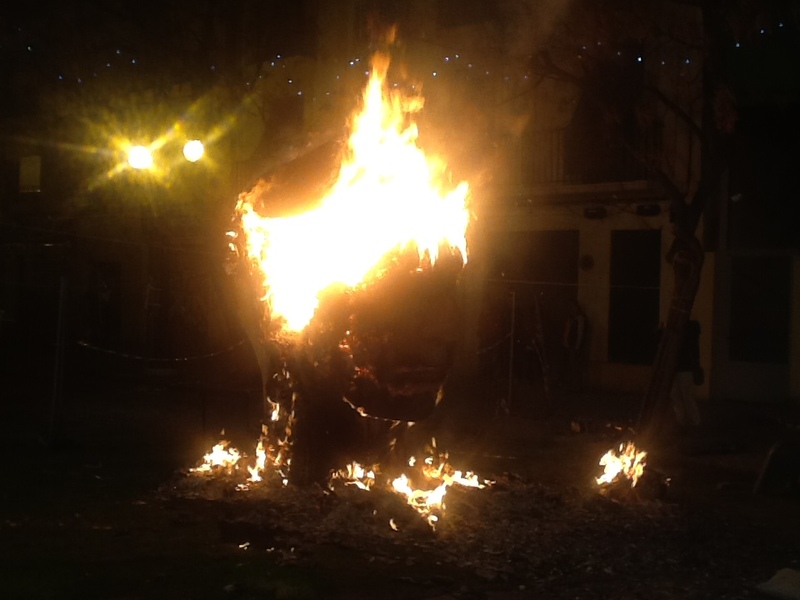 We learned that the children’s falla had cost some 4,000 Euros to build and the main one came in at just under 7,000 Euros. 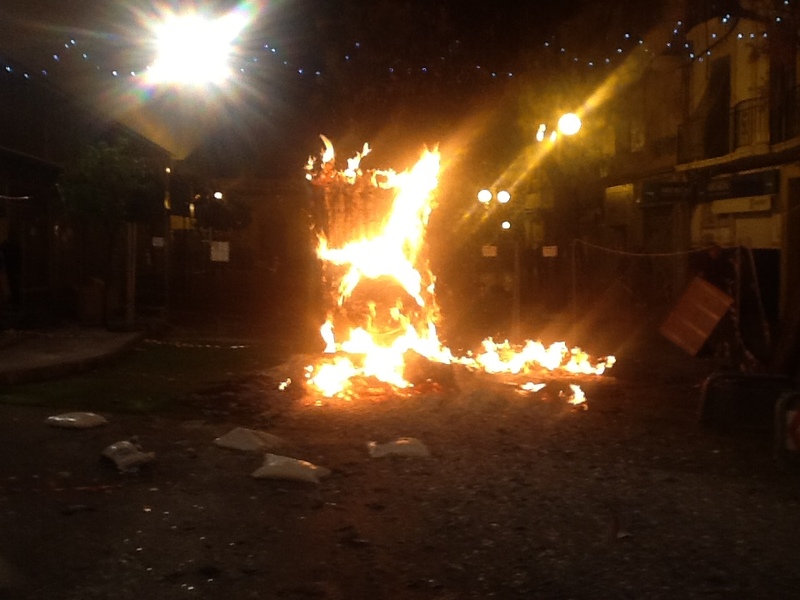 The money to build these as well as the cost of food and drink during this period comes from dues and a variety of fundraisers. 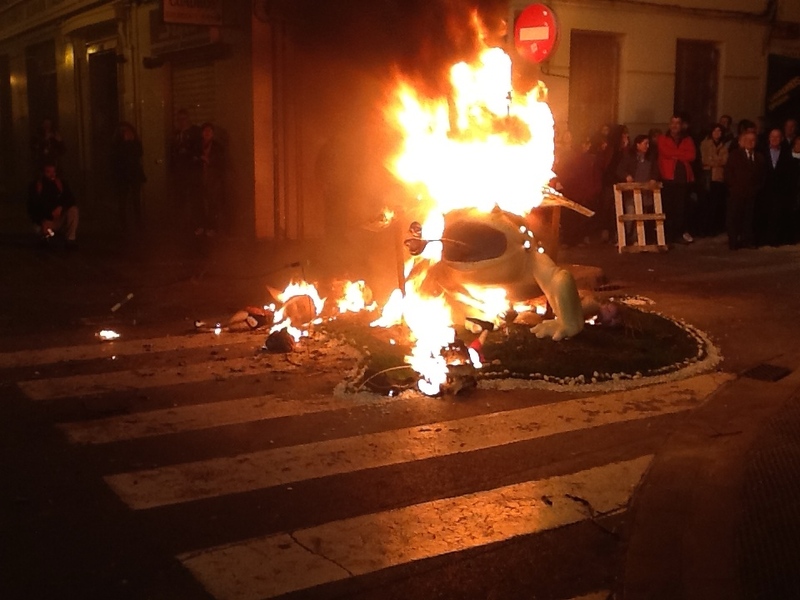 One of the most frequent questions that I get is why the fallas, which can be very expensive sometimes running into the hundreds of thousands of Euros, are destroyed. 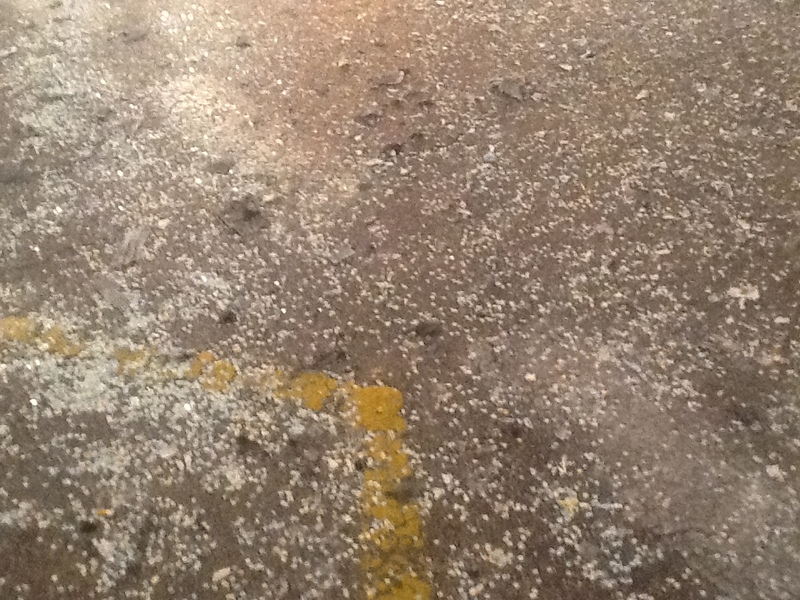 The simple answer is that is their destiny. 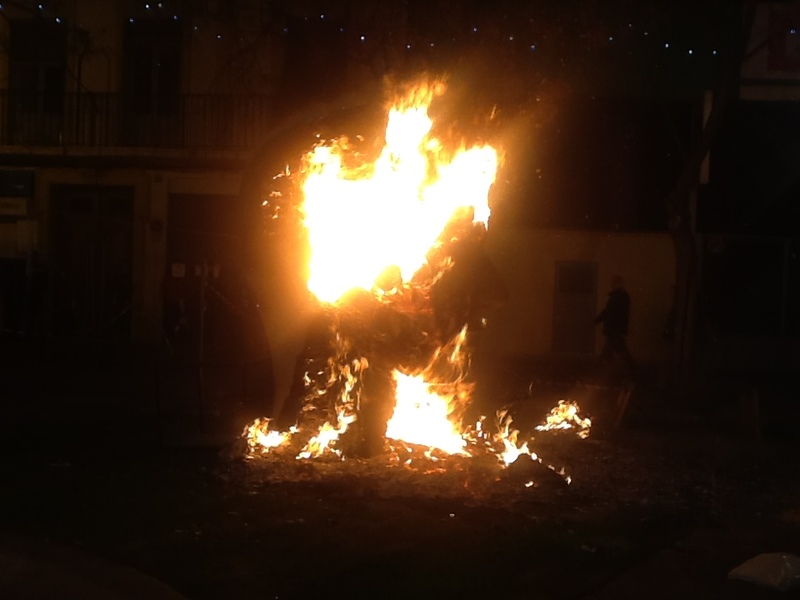 Fallas are built knowing that their fate lies in a fire that will totally destroy them. 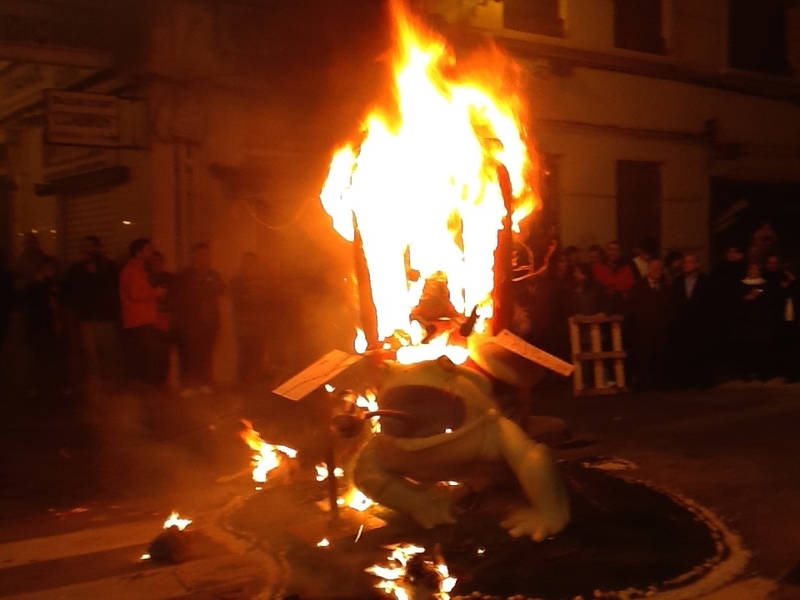 To a degree, the fires are symbolic and are rooted in the pagan past. 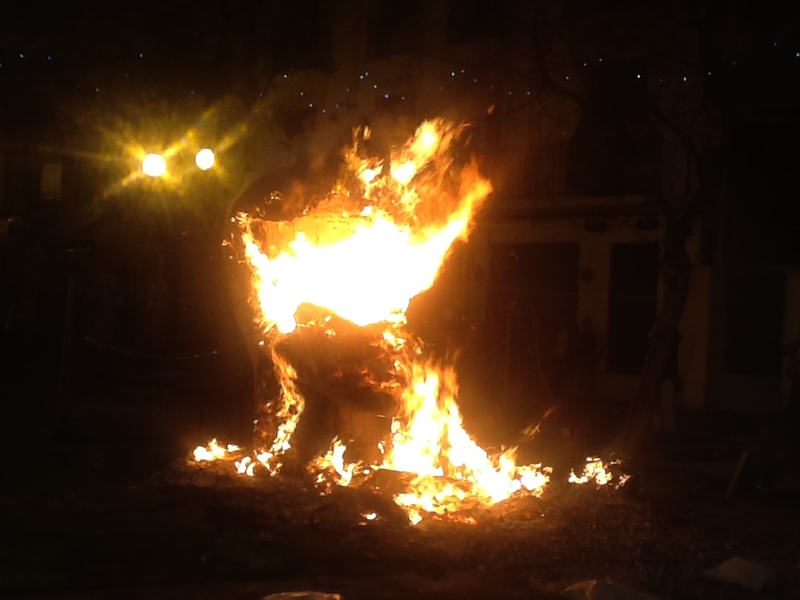 The fire is meant to fortify the sun and hasten the arrival of spring and one cannot fail to notice that spring arrives today. 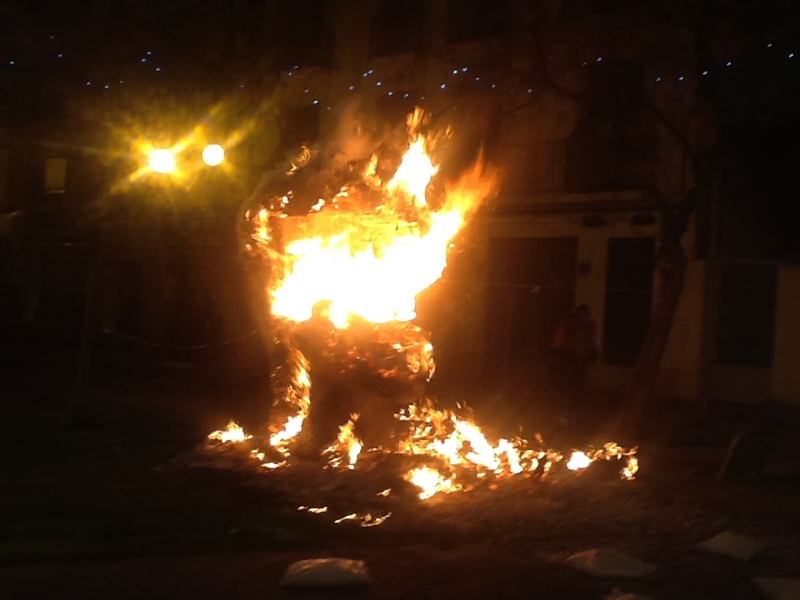 Additionally, a falla is built in such a way that it is temporary and would be subject to eventual decay when attacked by the elements. 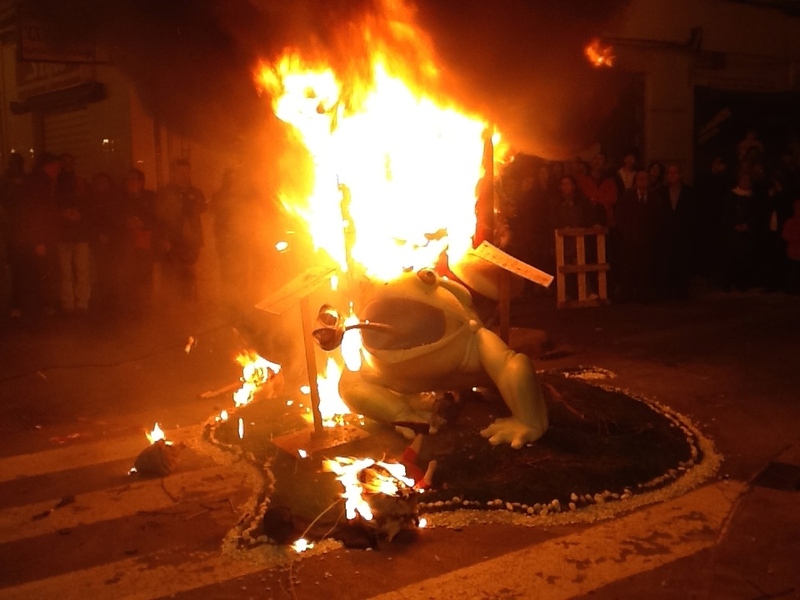 The comparison to the Rose parade floats is an excellent one. 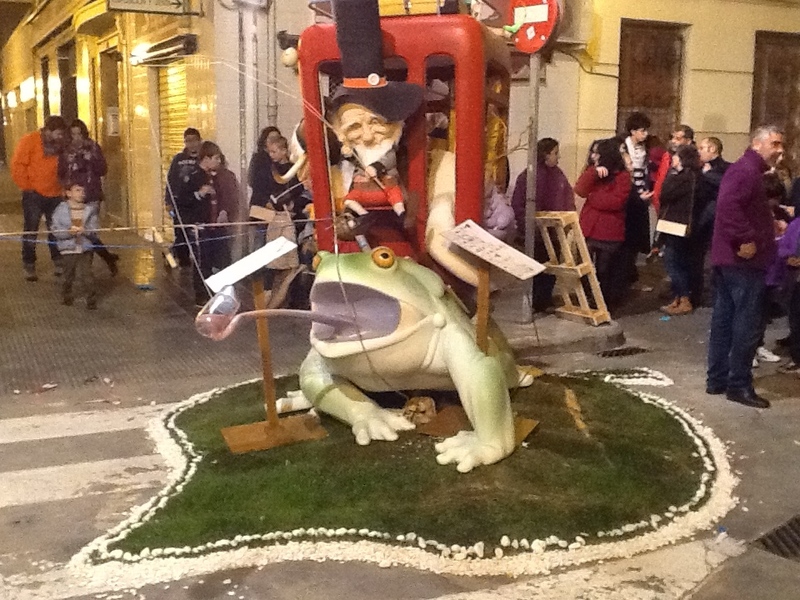 Time, effort and money are invested in the building of a float that is pleasing to the eye and meant to be admired. After the viewing days in the park, the flowers have died and the life of the float has come to an end. 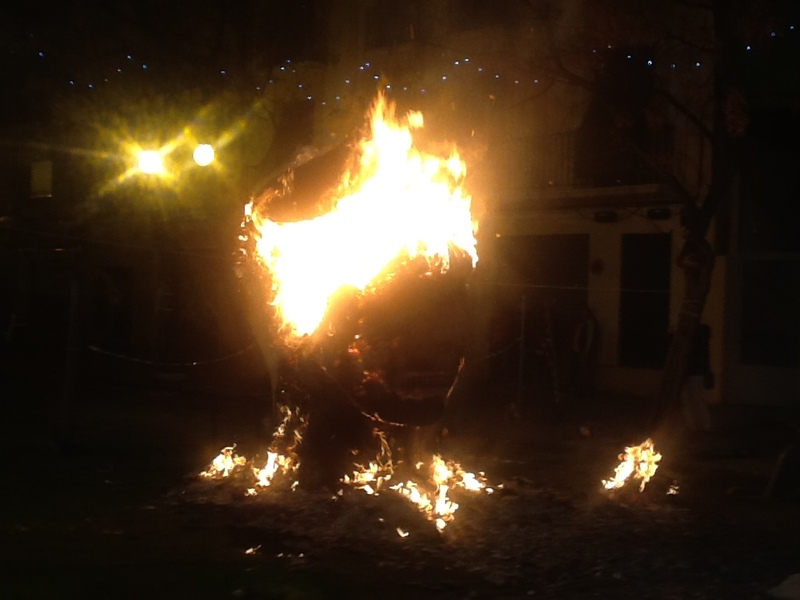 When we arrived preparations were being made to prepare the children’s falla for its demise. 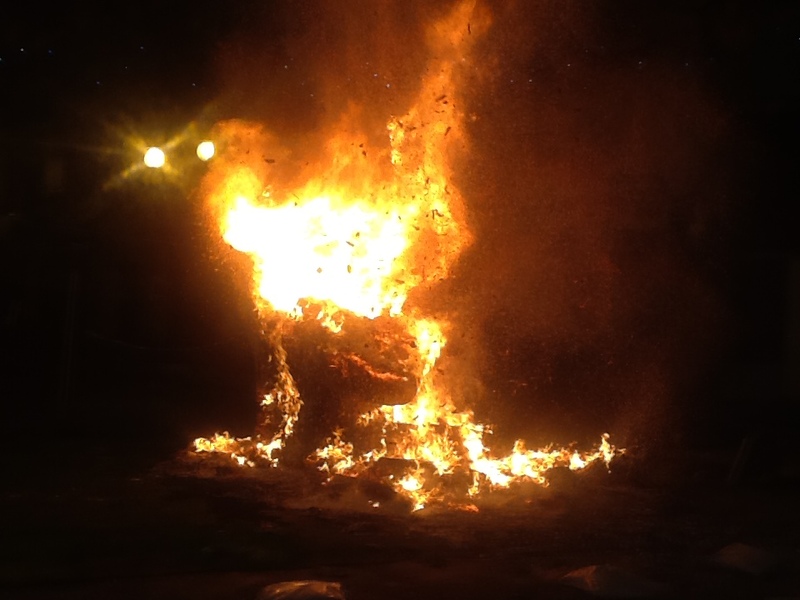 Holes were cut in the structure to facilitate the burning, as well as to serve as a receptacle for some additional fireworks and/or gasoline. 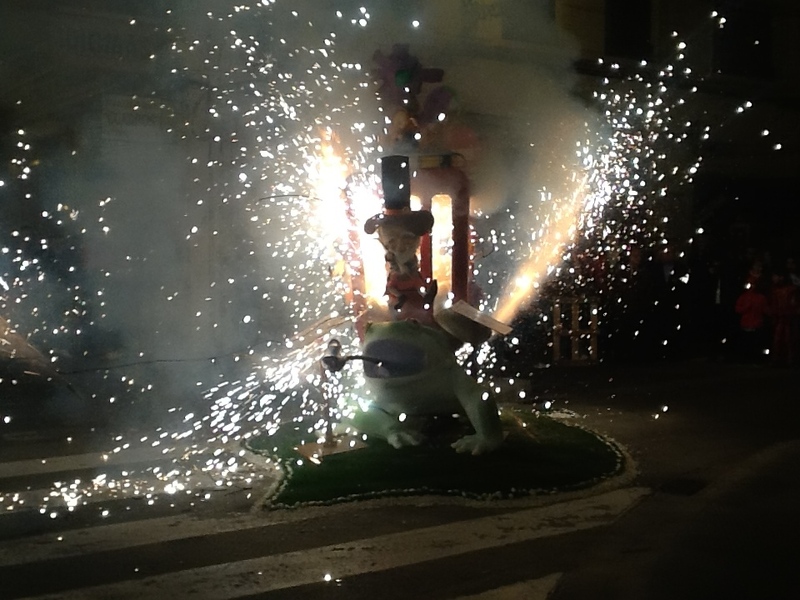 Fireworks are strung on nearby posts and their terminus is the falla itself and the fuse that will begin the conflagration. 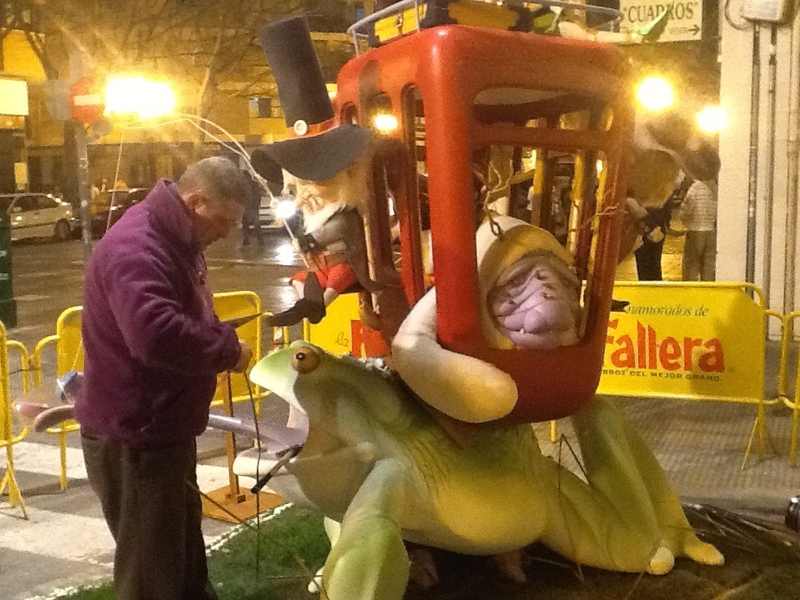 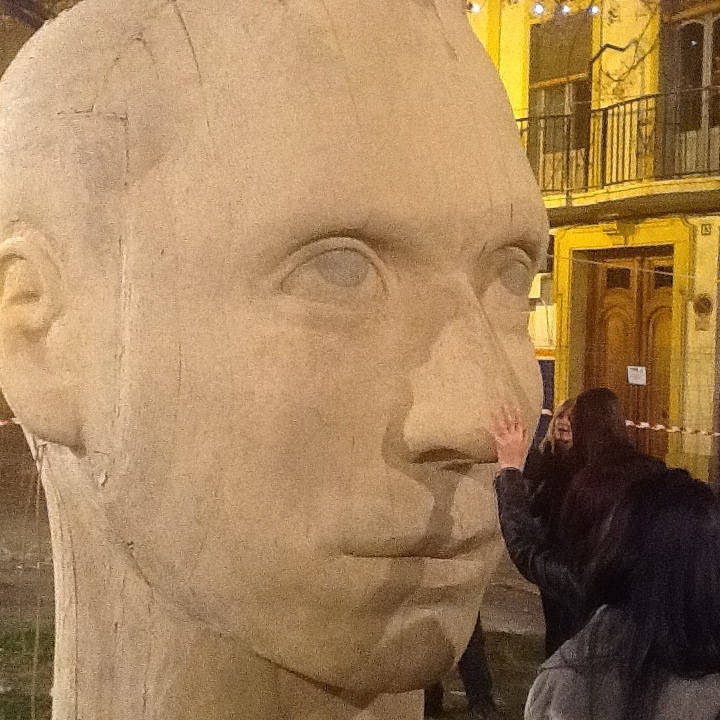 The president of the casal is allowed to keep one of the ninots of the falla as a reward for all his hard work. 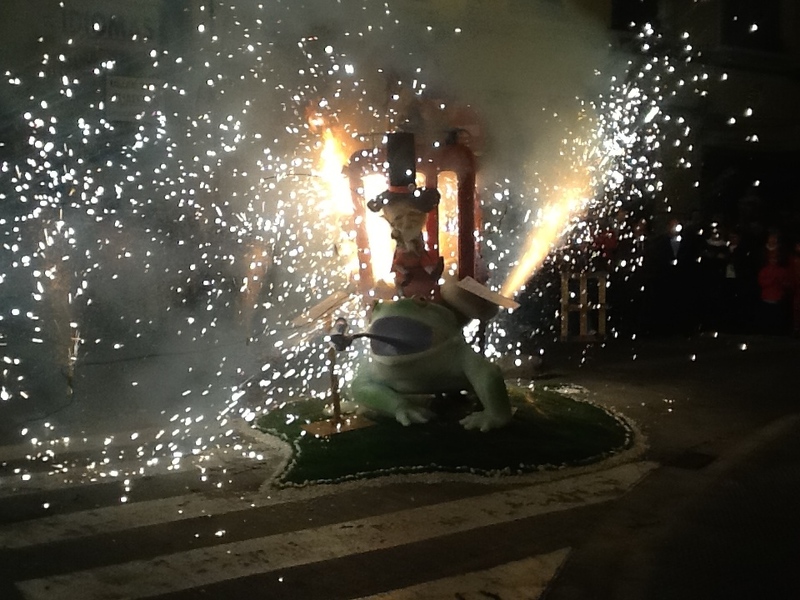 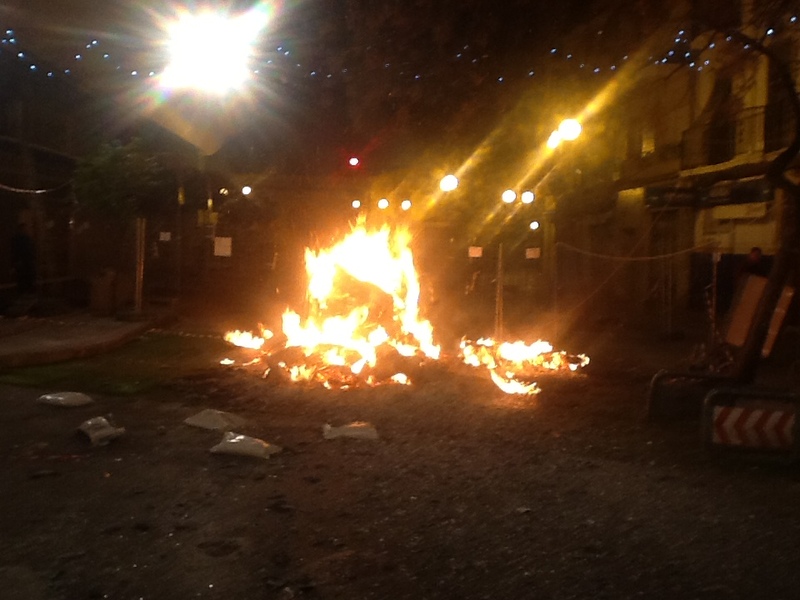 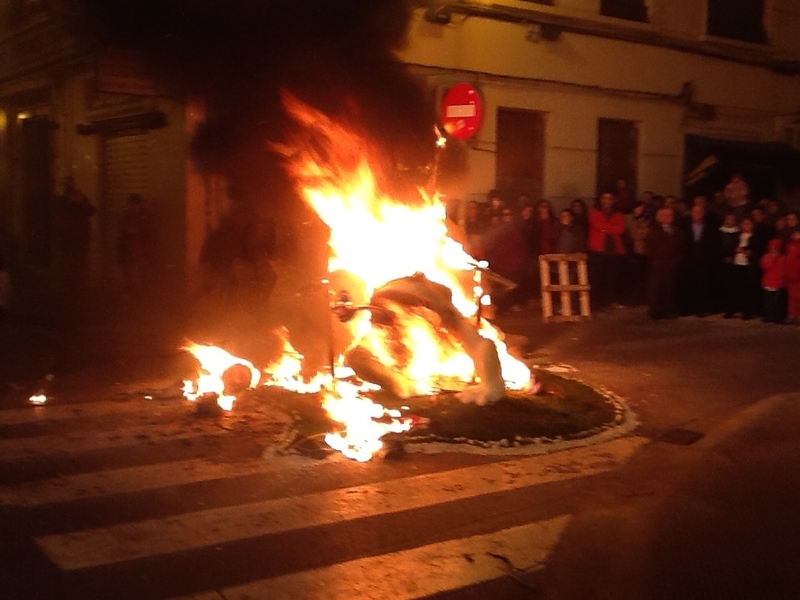 At 9:30 the fuse was lit, the fireworks exploded and the falla caught fire. 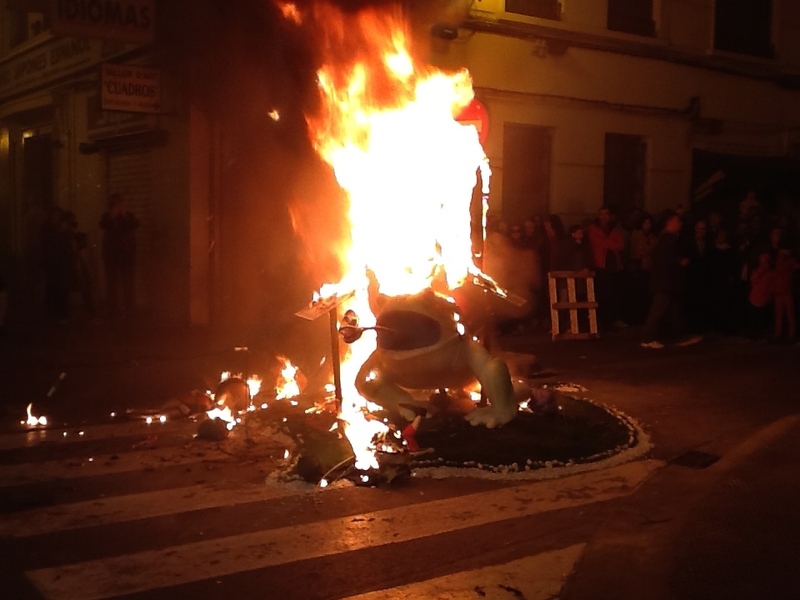 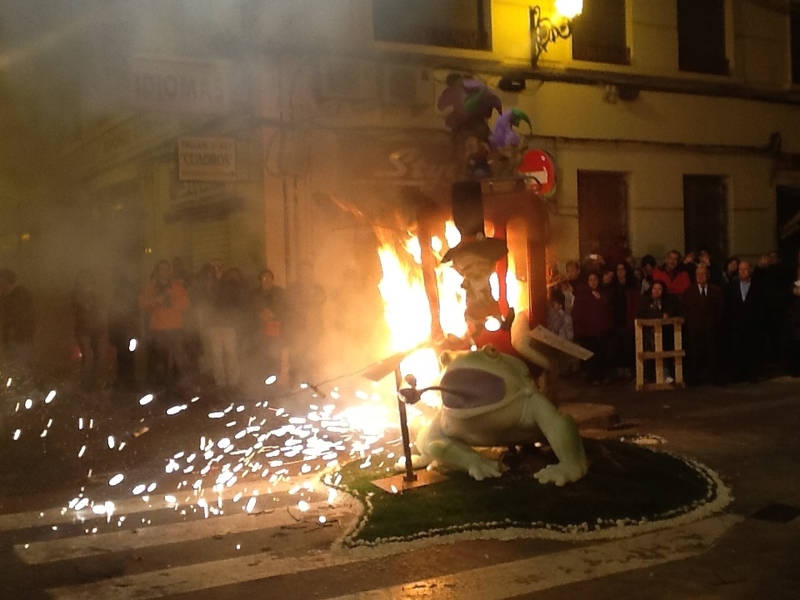 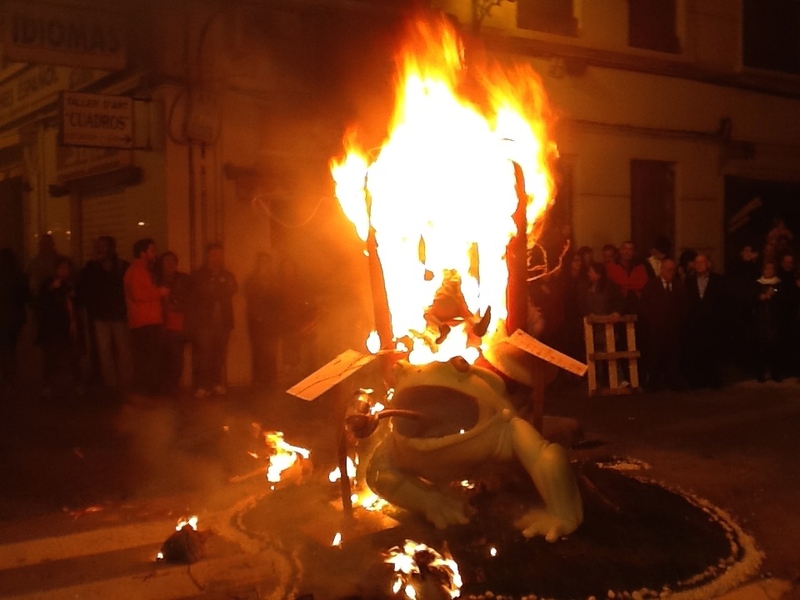 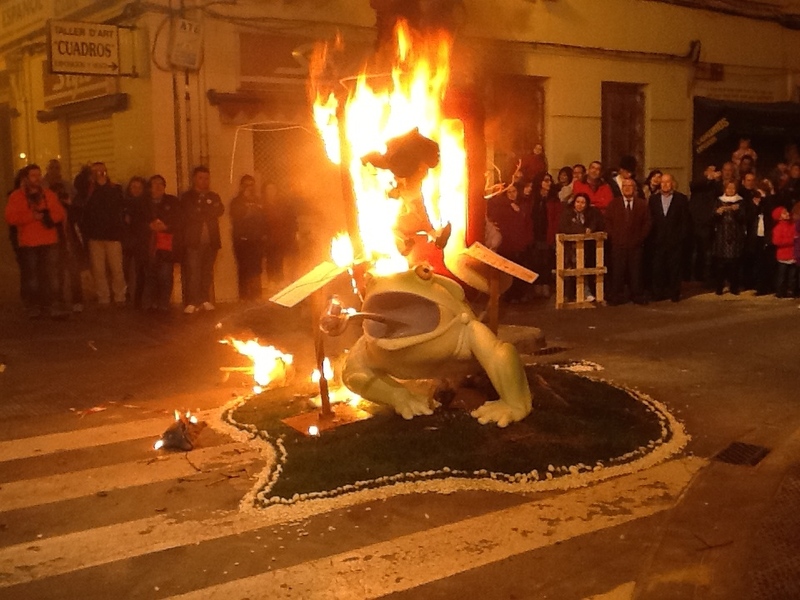 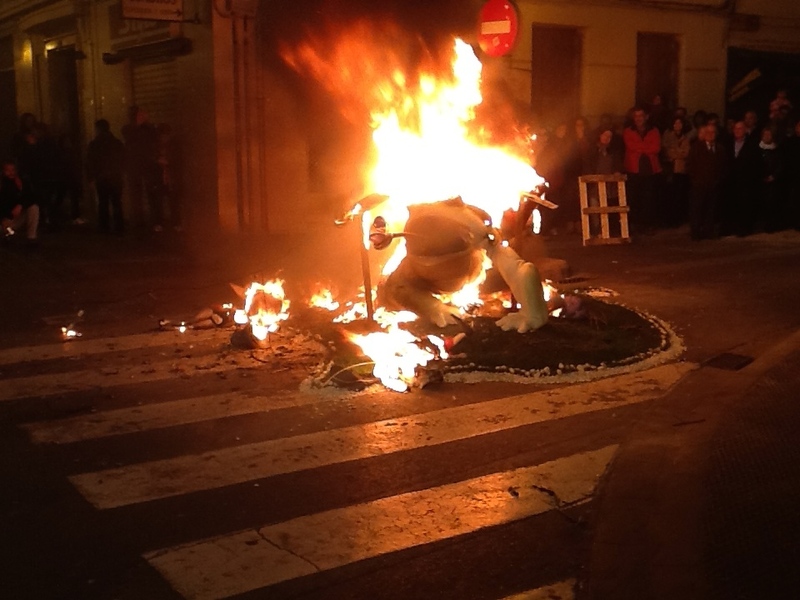 Given the fact that this falla has such a low profile the Fire Department does not need to be present for the burning. There are however volunteers standing by with fire extinguishers just in case. 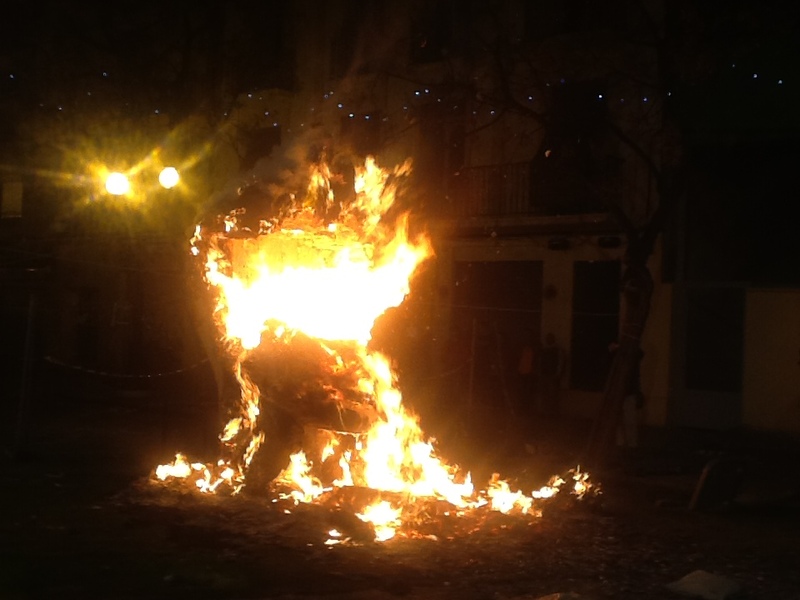 The destruction of the fallas is a very emotional event for a variety of reasons and as I looked around I could see that many people, both young and old, were in tears. 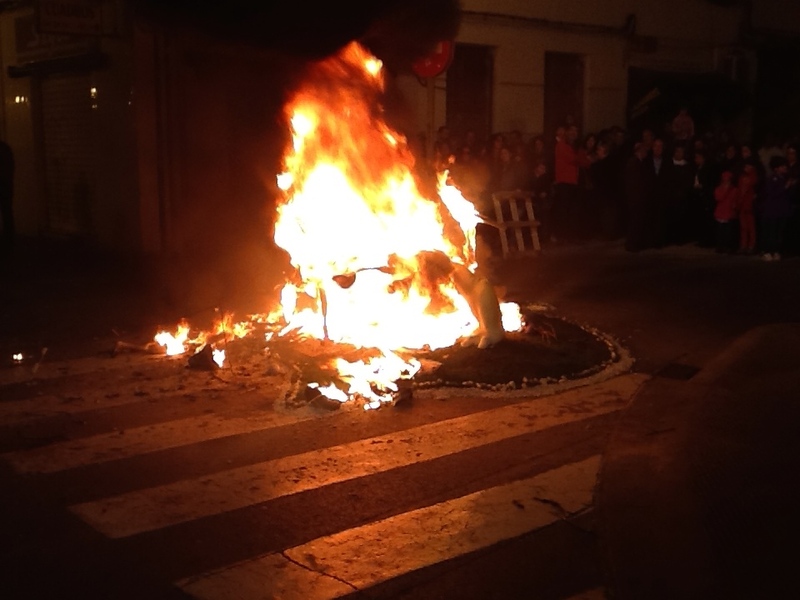 It took less than twenty minutes for the flames to do their work. 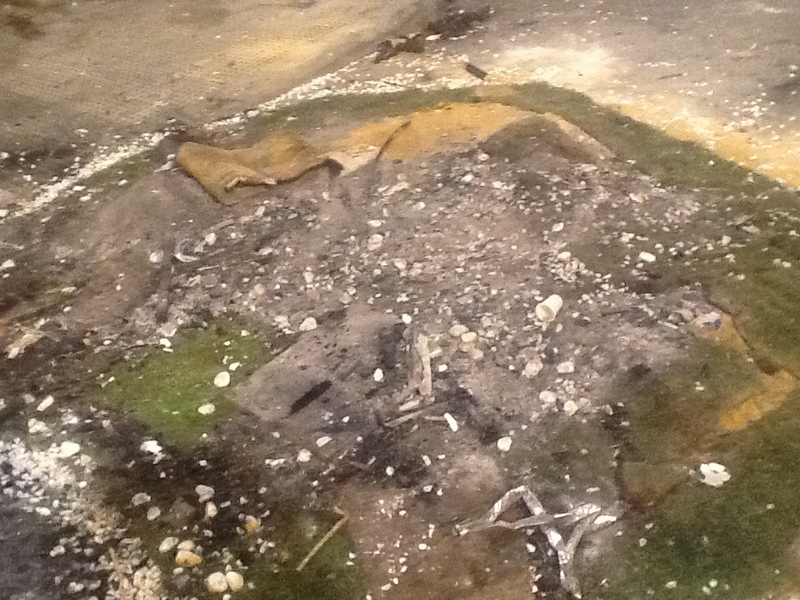 We then gathered in the tent for the last meal. 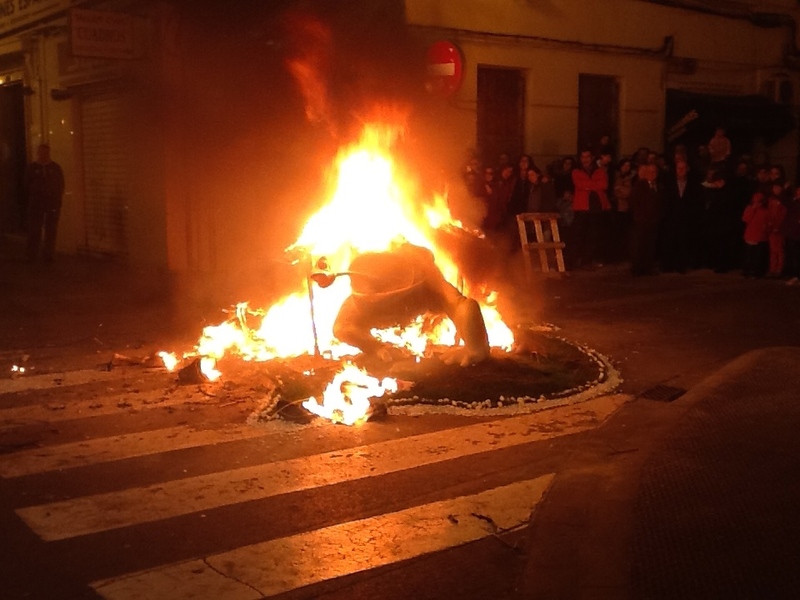 One of the guiding principles of this casal is waste not and want not, so tonight’s tapa meal was made up of leftovers from the past few days. 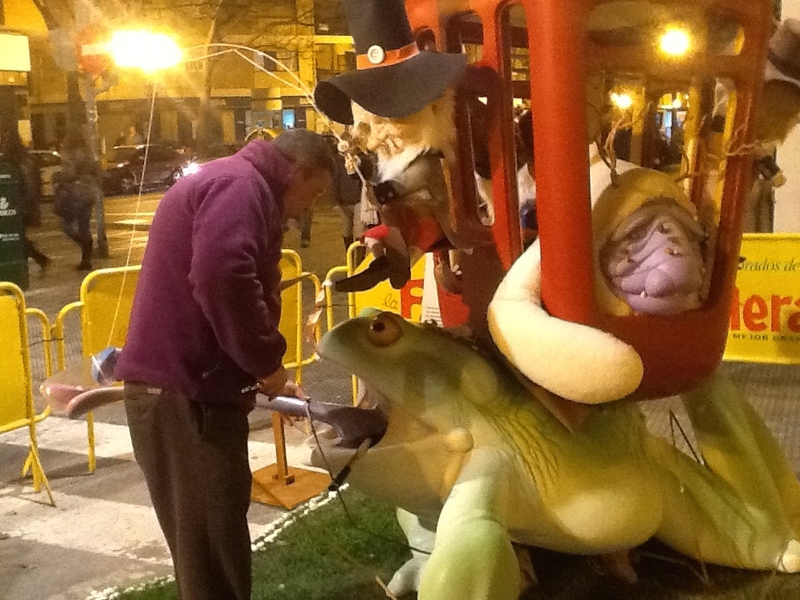 We enjoyed a variety of cold cuts, cheeses, salty treats, tortilla española, ajo arriero and longaniza. 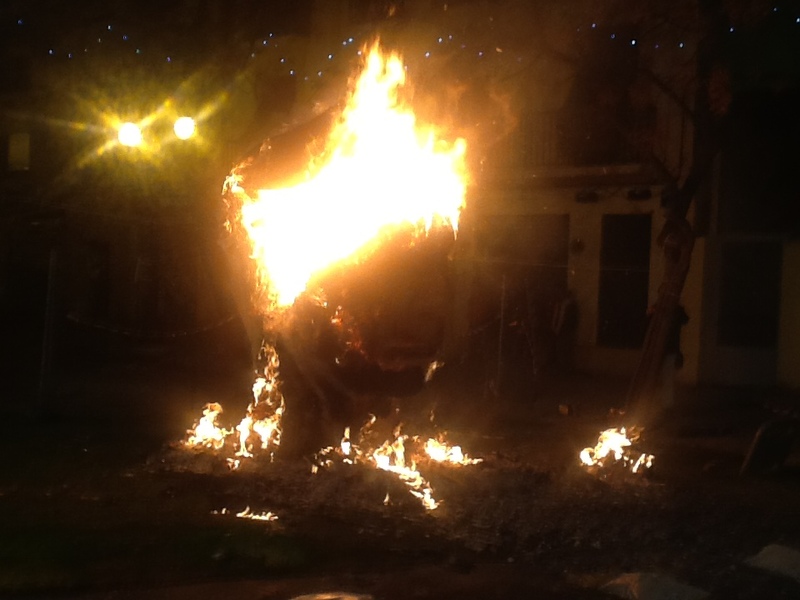 When the meal was over, all the chairs were stacked, the tables folded up and the tent at the ready to be taken down by the rental company early next morning. 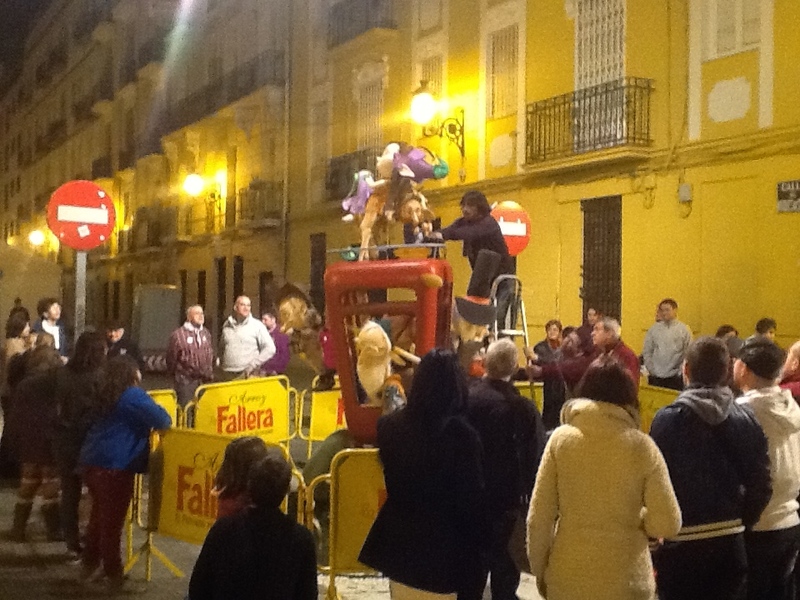 We all gathered around the remaining falla as it was prepared for its final act. 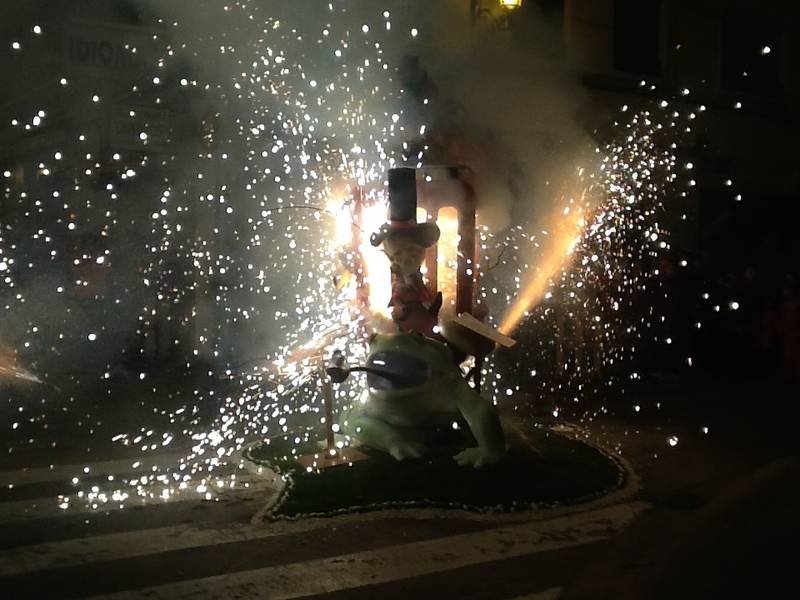 There was a rapid succession of aerial fireworks and then the string of fireworks that encompassed the falla was lit and up it went. 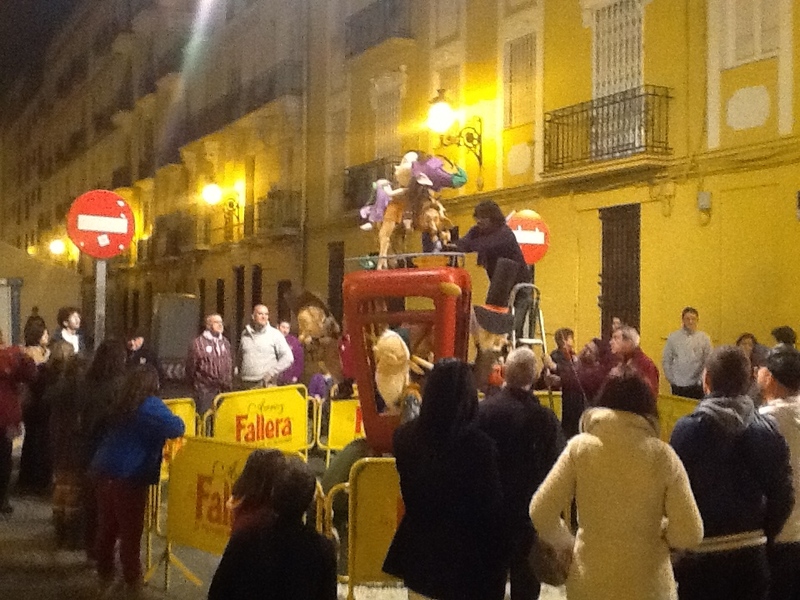 People gathered round to hug each other and congratulate one another for a job well done on this year’s event. 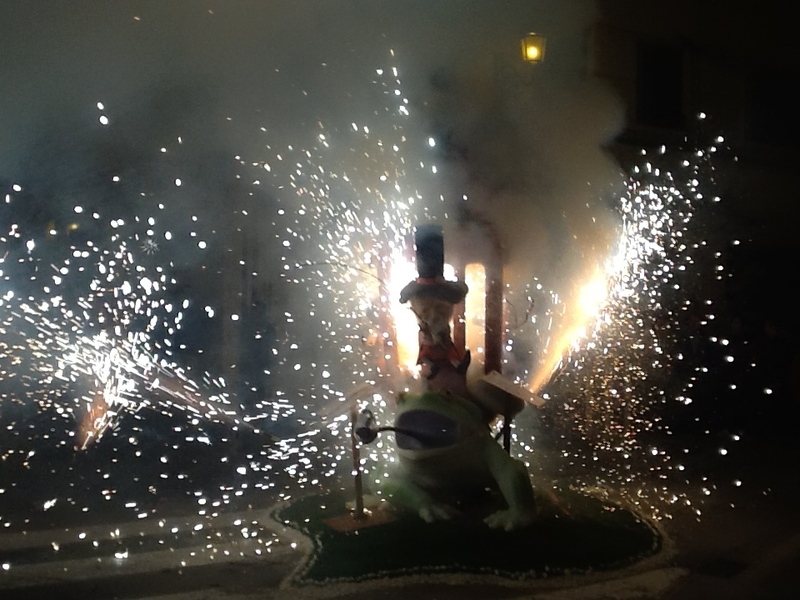 We felt very privileged to have participated in the festivities as an insider and to see and experience things that others only get to read about.